The latest in cutting edge fusion technology! 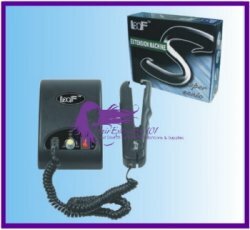 A step up from heat fusion, this Loof ultra-sonic fusion iron uses ultra-sonic waves to apply fusion bonds without heat. This method of application prevents burns to the fingers and the scalp, and significantly reduces application time! This same type of machine is available from other companies (like So-Cap & Great Lengths) for over $5000 with training seminars, and is only available to licensed professionals. This is NOT the same machine, but the same technology, works the same way and is now available & affordable to the professionals and the DIY'ers!